The community Mikvah, managed by Calgary Jewish Federation, is on the premises of the House of Jacob-Mikveh Israel synagogue, 1613 - 92nd Avenue S.W. A mikvah is a pool of naturally collected water that was never stagnant or gathered by human means. The pool is designed specifically for immersion, according to the rules and customs of Jewish law. It contains about 200 gallons of water. Water is the primary source of all living things. It has the power to restore and replenish life. A mikvah must be filled with living waters from a flowing source, such as fresh spring water, rainwater, or even melted snow. The water is kept under strict hygienic control, and is cleaned regularly. WHAT IS THE PRIMARY USE OF THE MIKVAH? It is used by women as part of the mitzvah best known as Taharat Hamishpachah or Family Sanctity. WHAT ARE SOME OTHER USES FOR A MIKVAH? Use of the mikvah is delineated in Jewish Law and dates back to the dawn of Jewish history. It covers many elements of Jewish life. 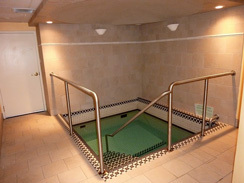 The Mikvah is an integral part of conversion to Judaism; mikvah is used, though less widely known, for the immersion of new pots, dishes, and utensils. The mikvah concept is also the focal point of the Taharah, the purification rite of a Jew before the person is laid to rest and the soul ascends on high. The manual pouring of water in a highly specific manner, over the entire body of the deceased, serves this purpose. Mikvah is also used by men on various occasions; the most widely practiced being immersion by a groom on his wedding day, and before Yom Kippur. HOW CAN I LEARN MORE ABOUT THE MIKVAH? Speak to your halachic authority or call 303.323.MOED for more information. WHAT IS THE IMPORTANCE OF THE MITZVAH OF MIKVAH? Although it is not as famous, religiously speaking, the mitzvah of mikvah is on par with fasting on Yom Kippur. Traditionally, building a mikvah took precedence over a synagogue. Both a synagogue and a Torah Scroll, Judaism's most venerated treasure, may be sold to raise funds for the building of a mikvah. While the synagogue represents the community, the mikvah is a symbol of the family. We cannot build communal life before first securing our family life. One must flow from the other. Successful families make successful communities. As sacred as the synagogue may be, the mikvah can be a deeply meaningful spiritual experience in the life of a Jewish woman. As one woman put it, "Sometimes I feel my femininity, and sometimes I feel my Jewishness. It wasn't until immersing in the waters of the mikvah that I felt both simultaneously." The room on the left is for women only. All men are required to shower before entering the Mikvah. See THIS SHEET. A list of rules will be posted at the Mikvah and will also be mailed to the male users along with the invoice. A container of cleansing wipes is placed on the stairs leading to the Mikvah. Please wipe the stairs and clean after use to assure no hair is left. Please remember that this is a WOMENS MIKVAH and must be respected as such or men may lose their privilege. The Calgary Jewish Federation Community Mikvah is open to all Jews who wish to use it, regardless of affiliation, membership or level of observance. We rely upon your financial assistance for operating costs. For your convenience we offer both annual memberships and per-use fees. Thank you for your financial support with this sacred work. Women as always. Men see below. For tevilas keilim (utensils), contact the mikvah to make an appointment. Towels are provided for mikvah users. Bedikah cloths are available for purchase at the mikvah.